This is the initial release of the Desktop version of Habit Media Engine, a HabitRPG client. 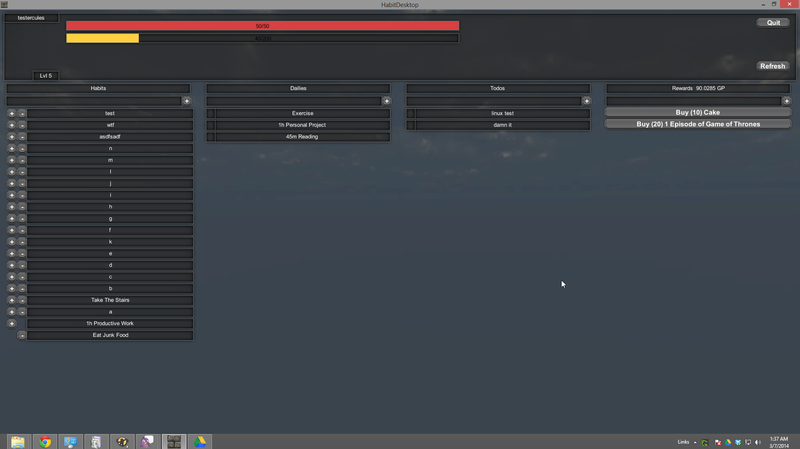 Habit Media Engine is created using the Unity game engine. By using Unity, Habit Media Engine can be built for OSX, Windows, Linux, Android, IOS, Windows Phone, Blackberry and Web with only very minor modifications in the code base. Mobile and web clients be released at a later date. Habit Media Engine is currently missing a lot of functionality. I have very little formal training in computer programming and none in C#. Data entry when "enter" is pressed. The button will have to be clicked. Scrolling only works with the mouse wheel, and the scroll bar texture doesn't look the way it's supposed to. Lots of functionality still needs to be added. See roadmap below. Disclaimer: There is no timeline for these features. A fully functional HabitRPG client for all desktop and mobile target platforms. A modular system for new 3d, 2d, text, and video content to be created and added by content developers. All of my life, I have had goals and ambitions that I could never find the motivation or discipline to accomplish, and I know I'm not the only one. I believe that HabitRPG has great potential as a tool for behavior modification, to help people like me accomplish their ambitions, and I am creating this client as an improvement to that system. I believe that the meaning of human life is to contribute to the longevity of mankind, with the ultimate goal being the eternal physical existence of our descendants. If that seems strange, consider this: Any good parent can tell you that their goal is a better life for their children. Multiply that by an untold generations of parents and untold generations of children. Choices made today can affect lives that will come many generations from now. Let's call it "Human Continuity". What does Habit Media Engine have to do with Human Continuity? Eternal Human Continuity is the ultimate goal, and Habit Media Engine(and HabitRPG) is a tool to help accomplish goals. My name is Stewart J. Martin, and I am the sole creator of Habit Media Engine(I did receive some help from my brother, Nathan Martin). I created my first video game in Qbasic at the age of 16 or 17, a very easy, very basic maze game. I then took a visual basic class for an electronic technology course. After that I quit electronic technology and programming and started doing CADD and 3d Modeling and Animation. I recently graduated from UAFS with a Bachelor's Degree in Animation Technology. I'm currently looking for work. Send serious inquiries to stewartjmartin (at) gmail (dot) com. You can see a youtube playlist of some of my earlier work here. 3/13/2014. Added Third party info. 9/23/2014 These binaries won't work anymore. I'll post some new ones soon. I'll give it a twirl!